Buddha's Herbs, online at buddhasherbs.com, is the place for natural dietary supplements, vitamins, and herbal teas. Buddha's Herbs offers huge discounts on dietary supplements, vitamins, and herbal teas. Buddha's Herbs carries herbal supplements, multi vitamins, vitamins, and herbal teas. Buddha's Herbs offers solutions for beauty, energy, heart health, immune health, cholesterol, liver health, weight loss, brain health, joints, bones, and sleep. Check out RetailSteal.com for the latest Buddha's Herbs discounts, Buddha's Herbs promo codes, and Buddha's Herbs coupon codes. Buddha's Herbs offers shipping promos that change often. Stop by RetailSteal.com for the latest Buddha's Herbs shipping special offers. Use this coupon code at Buddha's Herbs to get a 10% discount on purchases. Click our link to shop now. Shop at Buddha's Herbs and enjoy 30% savings on orders $100+. Click here to shop. Shop at Buddha's Herbs and save up to 30% on select oils, vitamins, and supplements. Shop at Buddha's Herbs and save 50% when you buy 5 or more items. Shop at Buddha's Herbs and save 30% when you buy 2 or more items. 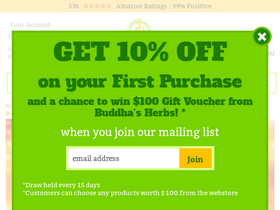 Sign up at Buddha's Herbs and save 10% on your first order. Spend $20+ at Buddha's Herbs and get free shipping on all orders.